A new report says Google is adding new self-destructing email features in Gmail. The new “confidential mode” will reportedly let users set their emails to expire after one week, one month, or other time periods. Gmail users can also make recipients type in a passcode to open emails. A few days ago, word got out that Google was working on a major revamp of Gmail, and later we posted what that redesign will look like in a set of exclusive screenshots. Now, another report claims that Google is working on a new addition that will include self-destructing email features. TechCrunch provided screenshots showing the feature, called “confidential mode”. It will reportedly lets Gmail users send emails that can be set to expire, meaning that the recipients won’t be able to download, forward or print those emails after a certain time period. They also won’t be able to copy and paste the email’s content. Confidential mode can be timed so that the emails will expire after just one week, or you can set it up so they expire after one month, or even after several years. Obviously, this kind of feature can come in handy if you don’t want certain emails to float around long after you send them. 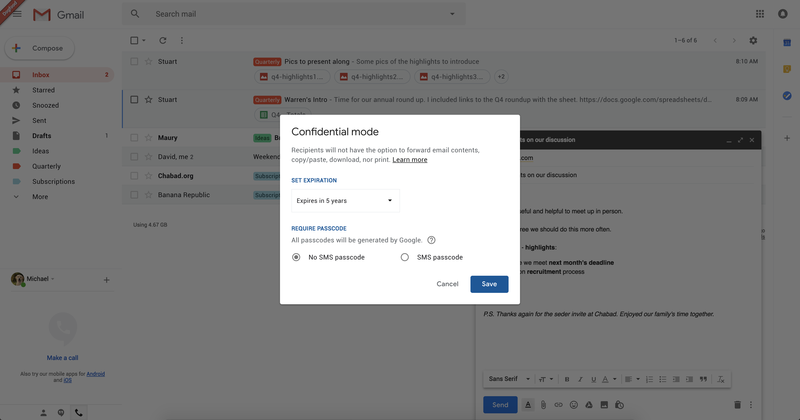 In addition, the report says that Gmail’s upcoming confidential mode will add an option so that recipients will need to enter a passcode so they can read emails. The passcode can be sent to the recipient’s phone via a text message. TechCrunch says that it is unclear if this new feature will work with emails sent to non-Gmail users. It’s also not confirmed that these emails will include end-to-end encryption. Hopefully we will learn more about confidential mode in the coming weeks, ahead of the planned Gmail redesign launch. In the meantime, what do you think of this possible new self-destructing email mode for Gmail?